"This disegno, when it brings forth a creative idea from our critical faculty, requires a hand ready and able, thanks to years of study and practice, to draw and to express well whatever thing Nature has created, with a pen, a stylus, a charcoal stick, a pencil..."
Missing the so-called High Renaissance period of Leonardo da Vinci, Michelangelo, and Raphael by almost a generation, Giorgio di Antonio Vasari emerged around the 1530s as an important link in the development of Italian Renaissance art. He is well respected as a painter and architect, especially in his frescos and his use of the lt;span class="marked_text chart-tooltip-target-top tooltip_id-mannerism">Mannerism style to intensify his biblical narratives. Yet most commentators would agree that his great contribution to the history of Western art history came not via an artwork at all, but rather via a tome: The Lives of the Most Eminent Painters, Sculptors and Architects, first published in 1550. In The Lives (as it has become known), Vasari introduced for the first time the now familiar art historical convention of using biological models to bring meanings to specific artworks. According to scholar Andrew Ladis, Vasari turned Michelangelo (in particular) into "the triumphant savior of the arts, a figure of light" as he put it. Presenting a view on the Renaissance which persists to this day, The Lives decreed Vasari's era as the "rebirth" of art after the fall of Rome, with the works by proto-Renaissance artist Giotto representing the beginnings of art's aesthetic ascent. 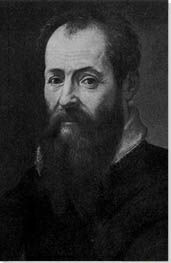 Vasari was first and foremost a frugal businessman. He realized the part "artistic influence" could play in elevating the value attached to an artwork. His position helped initiate a shift in thinking that saw painters - or, rather, some special painters - occupy a higher status than mere artisan. If one could present themselves as an artist, then the greater their chances of achieving fame and financial security. His position was summed up in this remarkable address to his erstwhile colleagues and masters: "Once I was poor like all of you but now I have three thousand scudi or more. You considered me awkward (as a painter), but the friars and priests consider me an able master. Once I served you, and now I have a servant of my own, who looks after my horse. I used to dress in those rags worn by poor painters, and now I am dressed in velvet. Once I went on foot, and now I go on horseback." 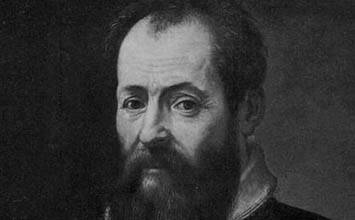 Vasari gained early notices for his commissioned portraiture. He favoured pastel tones to bring out a humanist and sympathetic quality in his venerated sitters. To the ends of posterity, he would also pepper his picture frame with symbolism that would connote the gravitas and status of the individual in question. Having invested in the ideals of tonal harmony in his portraits, Vasari turned towards the techniques of Mannerism in his religious painting. These compositions relied more on artifice - unnatural colors, abnormalities in, and elongations of, scale, exaggerations in contrast and so on - with the intent of creating a sense of high elegance and heightened drama within the picture narrative. As author of The Lives of the Most Eminent Painters, Sculptors and Architects (Volume one: 1550; Volume two: 1568) Vasari effectively gave birth to a populist art history. It was by coming to understand the life and times of the Florentine and Venetian masters, Vasari believed, that one could get to the essence of Renaissance art. The book followed in fact an already established tradition in biographical writing, but Vasari brought a new anecdotal edge to proceedings while at times supplying a moral judgment on the activities of the artists in question. Many scholars have criticized The Lives for its biases and its surfeit of factual inaccuracies and embellishments. But the principle that the history of art (and literature for that matter) could be understood through the exceptional deeds of divinely gifted individuals has stood firm. It is quite true that many radicals and revisionists have produced treaties that challenge this romanticized, "bourgeois", approach to art history, but it is the idea of the "biographical legend" that has done most to promote the pleasures of art appreciation across all classes of art lovers. Giorgio Vasari, the eldest of six children, was born in 1511 into a middle-class family living in the Arezzo region of Tuscany. Giorgio's artistic leanings were passed down to him through the generations of family members. His great-grandfather Lazzaro Vasari had been a versatile artiste: a potter, a creator of decorated saddles, a painter of miniatures, and later, under the influence of his mentor Piero della Francesco, a fresco painter. Vasari's grandfather, after whom Giorgio was named, was less of an all-rounder but, like Antonio, he too was an accomplished potter. Vasari had been especially close to his great uncle, Luca Signorelli, himself a sitter for della Francesco's teachings and his perspective drawing. Indeed, little Giorgio had been a sickly child, stricken with frequent nosebleeds (and possibly severe eczema). Vasari would tell the story of how Signorelli would try to staunch his nosebleeds by applying a folk remedy that involved holding "a piece of red jasper to my neck with infinite tenderness." Interactive chart with Giorgio di Antonio Vasari's main influences, and the people and ideas that the artist influenced in turn.